Homer Babbidge 5-Year Plan Construction is Starting! We are beyond excited to start construction on our 5-year Master Plan. In the works for well over two years, all of the meetings, drawings, budgets, and timelines will be put into action this summer! As exciting as this is, it will also mean disruption to our patrons over the next few months. As a result, we are re-activating the Babbidge Building Blog to keep you informed on what is happening. Here you will be able to find up-to-date construction information, progress reports, stories about what we are changing and why, and what you can look forward to when you return in the fall. We also encourage you to keep posted on our social media sites – Twitter & Facebook. If you have not been with us all summer, you came back to a new look in many of the spaces in Babbidge. The project is still in progress and we are happy to report that most of the public areas are open for the first week back. Levels 2 & 3 Lobbies – have been completed. Administrative Offices – They will be done this week and the staff located in this area will be moving back in on Tuesday & Wednesday. 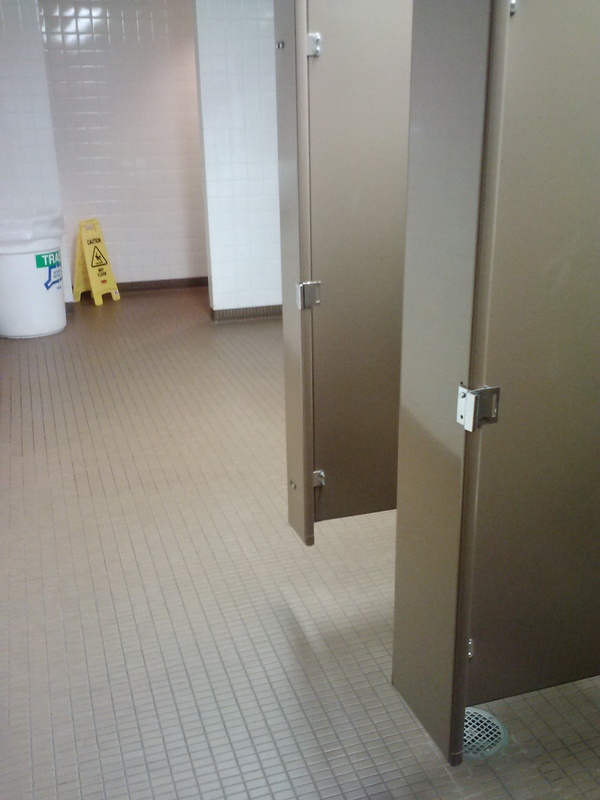 Levels 1 & 2 Bathrooms – If they are not as of this post, they will be open today. The final piece was getting the toilet paper holders on so folks could do their business. 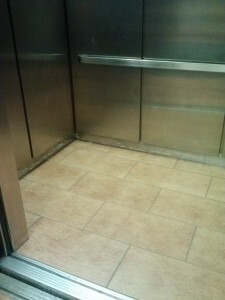 Elevators – Did you see how great the floor looks as opposed to the stained carpeting that was there? The base still needs to be applied but I’m sure you will agree they look great! Basement Bathrooms – The public bathrooms on Level B will be offline starting next week. We apologize in advance for the noise disruption that will happen when they demo the rooms, but we expect it to be quick. Class of 1947 – They will start carpeting that next week and we hope to have it back online for use by the week of the 9th. Thanks to everyone for their patience. We hope you have a great weekend! Only a few more days before the start of school and that means the contractors are putting finishing touches on many of the spaces they have been working on. Transition strips, securing handrails, and general clean-up are the name of the game. All lobbies are open to foot traffic as well as all of the classrooms, with the one exception of the Class of 1947 room on the Plaza. We know that having the lobbies inaccessible is inconvenient, but we hope you will agree that the final product is worth it! 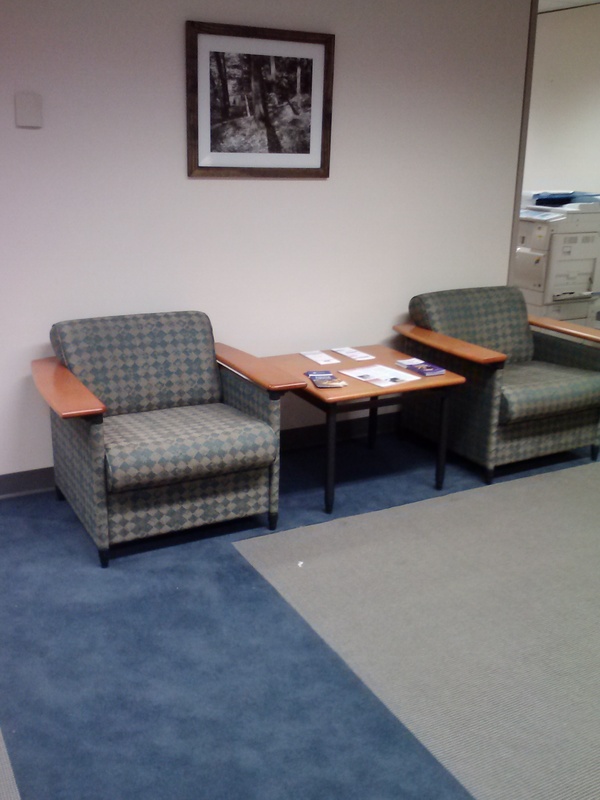 Work continues on the carpeting in our Administrative Offices over the next two weeks. 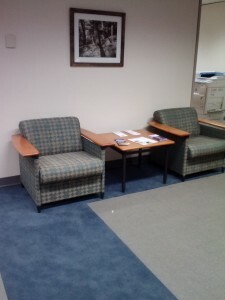 If you need to pick up your paycheck or have other business with the office, the receptionist has been moved to just before the Auriemma Reading Room on the Plaza level. The rest of the staff has been moved around and the reception desk can help you find anyone you need. The restrooms on Levels 1 & 2 are still not available. We are awaiting the partitions to be installed and hope to have that ready by early next week. Please use the restrooms on Levels 3 & 4, or on the Plaza. Elevators – the flooring on the elevators is being replaced with ceramic tile (yeah!!) and they will work on one elevator at a time over the next week. 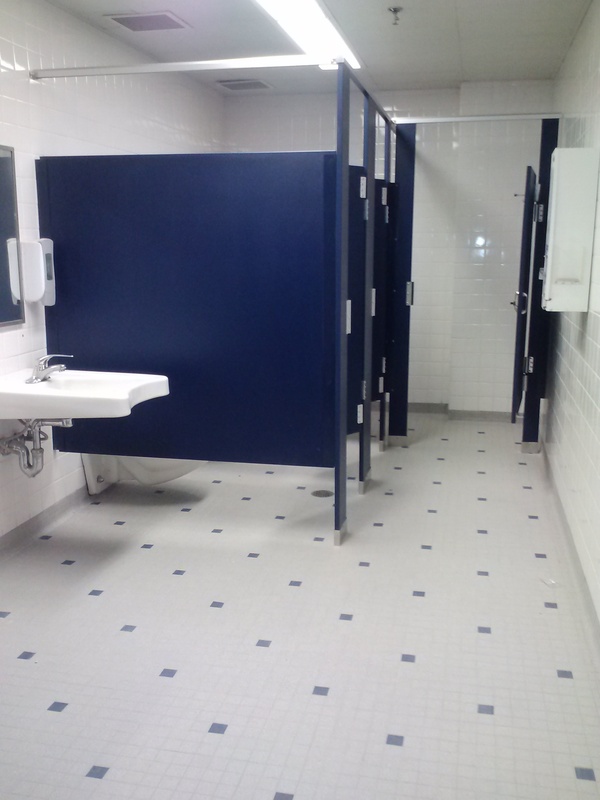 B Level Restrooms – they will begin to work on these possibly this week, but by next week for sure. 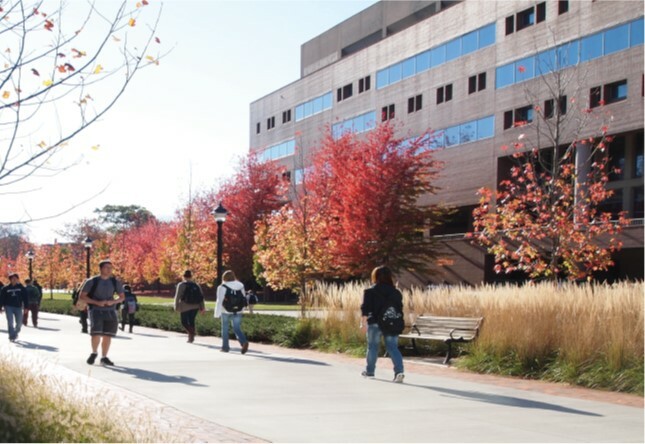 Again, we are grateful for your patience and work will continue throughout some of the semester, as well as during the winter breaks. Level 3 – is open for business, including all of the study carrels. There are some odds and ends still to do, including moving back of furniture, but it should not affect the use of the 3rd floor. Tomorrow they will begin on the Graduate Student Study Center. Level 1 & Level 2 Bathrooms – should be completed by the middle of next week. 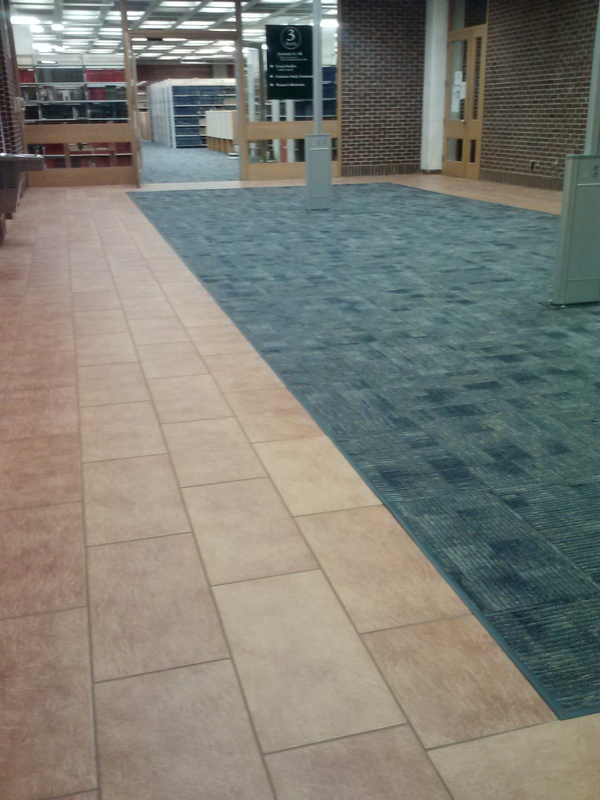 Plaza Level – The staff area behind the iDesk is completed and this week they have been working on the Auriemma Reading Room, the staff lounge and the 24-hour study room. They should be cleared of those areas later this week. 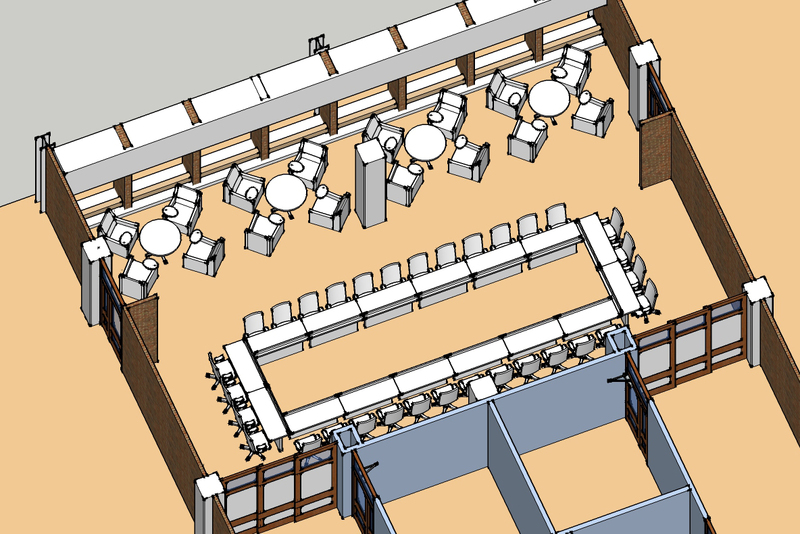 The Auriemma Reading Room will stay off line for a bit longer, as it will be the space where the administrative office furniture will be stored when that space is done. That space, and the Class of ’47 are the last pieces to be done on the Plaza Level. 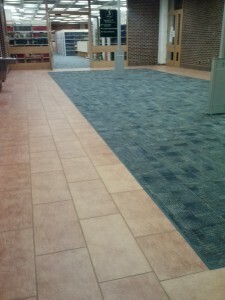 Level 1 – is completed in terms of the bulk of the carpeting. As on Level 3, there is clean-up and pieces that still need to be done. We also will be working on getting the furniture back where it belongs next week. The Q Center is open, and the W Center should be back in operation next week. The Digital Learning Center and our own help desk are also working to get their space back in working order. Babbidge Library Closed – Wednesday August 14th – 4pm. The Homer Babbidge Library will be closed at 4:00 pm on Wednesday, August 14th for electrical work. We expect to be open as usual on Thursday, August 15th. Our online services should not be affected during this outage.